This rare pre-1985 original vintage print has been produced in strictly limited edition numbers from a series of transparencies that Newton considered his most provocative and important work through 1985. Perhaps the most remarkable work, at least for its sensationalist story, in the gallery’s collection is this photograph of super-model Linda Morand posing as if she might be Jacqueline Kennedy Onassis. The two were well known for looking alike. Newton’s satirical reportage style shoot for Vogue Paris became an iconic Vogue spread. The notorious photographs emphasize the daring, vision of Helmut Newton’s creativity, his provocative perspective stretching even to the doors of the White House. As the story goes, Richard Avedon sent a telegram of congratulations on the series to Newton and letting him know that the former First Lady was getting ready to sue for defamation of image, but she never followed through. Madame Morand, who was the Viscountess Forquet de Dorne, was mentioned as a “Certain Client” and her name was printed in the Vogue series. This photograph has appeared in Museums and Exhibitions. The collection of vintage prints was gifted to Newton’s agent Norman Solomon, in recognition of the work he had carried out in promoting Newton’s “Private Property” series of exhibitions in 1985. The print comes with a Certificate of Authenticity signed by Norman Solomon. The ownership rights of this print are supported by an original agreement with Newton in 1984, and supplemented by a further agreement with The Helmut Newton Estate in 2012. This vintage print has been stored in conservation condition. When Linda Morand hit the fashion scene in 1966, Jackie objected to a model looking so much like her, She was certainly not pleased to be the dubbed the ‘older and less pretty one’ according to the articles. Diana Vreeland, a longtime family friend of the Bouvier sisters agreed that the likeness should not be promoted by Vogue. Linda decided it was better to move to Paris and stay there rather than face the former First Lady’s wrath. By early 1967 Jackie was a distant memory, not a tabloid superstar as she was in the United States. A few years later, Jacqueline Kennedy, the revered Widow married Aristotle Onassis and became a big headliner in the tabloids again. Now known as Jackie O, the former First Lady threatened to sue Newton, Vogue and Linda Morand for use of her image. Her attorneys advised her that she had no case. The article plainly stated that the story was about Linda Morand as a person, the type of lady who wore couture herself with her own name printed in the article. 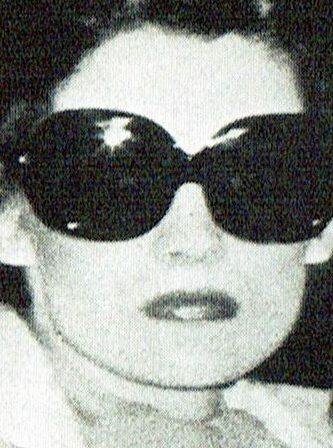 She was universally mistaken for Jacqueline Onassis striding through the streets of Paris. For years wherever I went, people would come up to me and say the same phrase: “Did anyone ever tell you, you look like Jackie Kennedy?” What was I supposed to say? “Yes, you idiot, everyone has told me! And it drives me crazy.” As a descendant of the highland Scots, I am a fierce individual. I felt defensive when people pointed out the likeness. What is the use of being considered beautiful if you can’t be original? I didn’t want to be a carbon copy of anyone. Still, it beat being a tall skinny geek who couldn’t get a date in high school. The Collections in Paris were coming up and I wanted to go. The office was crowded as a few of the top models stopped in. Eileen liked when the girls came by. She treated them like daughters. Sunny Harnett told me that Eileen would like to speak to me. Eileen was by the table where all the bookers sat. There were charts for all the models that slid back and forth. I had been moved from the Testing Board to the Junior Board. The phone was always ringing and the bookers chatted in several languages. “I had a talk with Diana Vreeland. “ Eileen said. She is not amused that you look so much like Jacqueline Kennedy. She doesn’t want you in Vogue. I am afraid you have an enemy of sorts.